1. Prepare outdoor grill for direct grilling over medium heat. In large nonstick skillet, cook bacon over medium heat 6 to 8 minutes or until crisp, turning occasionally. Transfer bacon to paper towels to drain. 2. In small bowl, stir mayonnaise, basil, lemon juice and chile sauce until well combined; set aside. 3. Spray both sides of chicken with nonstick cooking spray; sprinkle with salt and pepper. Place chicken on hot grill rack. Cover and cook 8 to 10 minutes or until chicken loses its pink color throughout and internal temperature reaches 165°, turning once halfway through cooking. 4. Cut baguette horizontally in half, then cut loaf crosswise into 4 equal pieces. Evenly spread mayonnaise mixture on bottom halves of baguette. 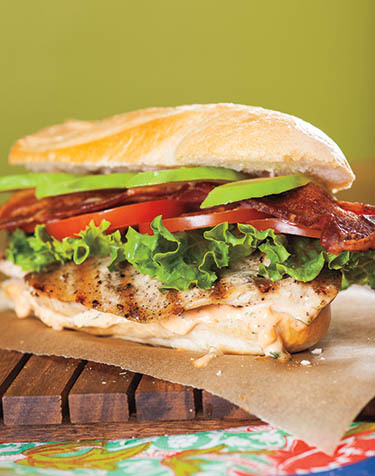 Layer chicken, lettuce, tomatoes, bacon and avocado over mayonnaise mixture; replace top halves of baguette.